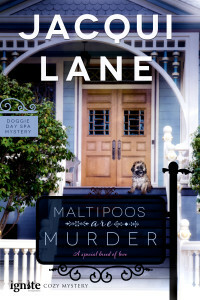 Authors Jacqueline Corcoran and Lane Stone, have teamed up to write about their favorite topics – dogs and Middleburg, Virginia, which has been called “the nation’s horse and hunt capital.” MALTIPOOS ARE MURDER is the first in their Doggie Day Spa romance mystery series. Cara Rogers has left her enviable Washington D.C. life and lobbyist boyfriend in disgrace to run her aunt’s pet spa in Virginia’s hunt country. When she finds her aunt’s body in the pool where the dogs’ swim lessons are held, handsome police detective Cole Sampson wants to rule the death an accident, but she fights him – and her growing attraction. Can a murder investigation keep these opposites from attracting? It’s going to take a special breed of love. A scream burst from my mouth before my mind fully registered what I was seeing. There was a body floating in the water. I ran toward the pool, slipping on the deck as I called out, “Aunt Marian!” The body in the navy wetsuit had to be her—the grey hair swishing around her head, the shape of a woman pushing seventy, albeit one who was incredibly fit. struggled to hoist her out of the water. But it was a useless gesture. She was cold and still, and clearly dead. That’s when I realized I was not alone in the pool room. A tiny dog—not more than eight pounds and soaking wet— huddled at the corner of the deck. With the usual animal’s sense, he must have known something was terribly wrong.